The landscapes of both domesticity and consumerism could be seen as notions fraught with ambiguity and parodyin turn reiterating the logic of modernity. Hobbycore, curated by Ricky Swallow, takes up these notions through the ideological premise of the hobby. The concept of the hobby, like that of TV, is encodedwith obsessions, pleasures and desires interplaying both space and place, readymade and hand-made. In order to address domesticity and consumerism one needs to go beyond the dialectical rhetoric of private/public, ornament/function, high/low. One needs to give up the end-product mentality and consider the processes and pleasures. In other words one needs to take up a hobby. Each of the eight participating artists negotiates the hobby beyond the Tonya Todman ("healthy, wealthy and wise") equation. Hobbycore could be seen to problematise the contemporary translation of the Renaissances liberal versus mechanical art in the form of art versus craft. Or in other words, the documentary becomes the mockumentary, the form does not necessarily follow the function. The discourse pertaining to TV is similar to that of the hobby. Both are consumed at home, both are reconfigured by spectatorship and speak of desires and pleasures disclosed to friends, family or anything one can claim as familiar. The hobby, like TV, is intra-generic, a mass of sub-genres and reformation of high/low categories. In addition, both TV and the hobby can be heralded as being part of the fashionability of the lowbrowa battle between the avant-garde and rear-guard. When entering the foyer of Stripp Ronnie van Houts surveillance monitor of mockumentary matter (involving a monotone view of a modelled gallery) invites the viewer to confront the scopophilia of the hobby and TVthe art of distraction. Simon Cumings Untitled also operates in a realm echoing that of the domestic, the mechanical sounds reiterating TVs usage of audio to redirect the spectator. The floor-based pyramid of little satellite models with LED lights quietly flash to a loud transmitter on the wall. Next to Cuming is Cathy Dalys Preliminary deconstructionsarchitectural models made from card. Paralleling the Semper and Loos binary of ornament versus structure, these forms also address the place/space translation being negotiated within Melbourne. In the corner is Jemma Upritchards Untitled (domestic scene) consisting of a taxidermed ginger cat and a wobbling, cheap ornamental wood table with model trees on top. Upritchards use of parody and ambiguity to circumnavigate the logic of domesticity is confronting and engagingthe cats vivid green eyes stare out at the spectator while its stiff, demented and crippled body attempts a frozen stance. Ronnie van Houts three monitors parallel Gary Perkins work. These scenes place the viewer at ground level, so that while the spectator may feel that the devices are similar to small, old domestic TVs, the elements of control, distraction and voyeurism are not. Running from a corner to half way along the back wall are Michelle Turners three works. The first is the beautifully sublime Treearium consisting of crystal/fossil-like resin forms in a fish bowl on a plinth with a blue painted top. The light is sensitive with its Boltanski-like dramatisation and the form aesthetically and conceptually is reminiscent of Louise Weaver. Range and Treescape are the other two works of Turners and although they are aesthetically distant from Treearium they wrestle with similar overlays of mnemonic modelling. Range and Treescape are large digiprints of miniature trees with oil pastel. These pieces, in their disparate rhythms of camouflage, patterning and cat-scan like repetition, site the acts of parody inherent within representation. Adjacent to Turner is Mark Dundons A.O.K Model kitsa slick display of packaged models with titles such as kenny khicken and time check. Like Jasper Johns ale cans, Dundons packages invert the readymade to comment more on the process, not the product, of representation, identification and technology. The package of domesticity is consumerisms oxymoron insofar as display is in conflict with purpose. Southpark makes a fine parallel with Dundons piece for both seem on the surface to be for children, but their subject matter is as adult as it gets. Dundons boxes promise a sleek package for children and yet they contain choking hazards. The mockumentary scenes further parody the ambiguity of possible histories in the form of mock war moments. One is made to feel that the space of consumerisms corporeality is always elsewhere in the place of desire. Ricky Swallows models turn form and function on its head. Model for High Security is a reconstructed Fairmont record player reformed into a cardboard complex with painted figures. Two moving parts rotate a couple of the figures in a demented version of Play Schools story time. Swallows work introduces the various trajectories of mimicry and parody invested in the form follows function rhetoric. Model for the circulation of break dancing is another version of the reconstructed record player (this time its the trusty Toshiba solid state) accompanied by a working record player with head phones to listen to Breakdance (1984). Swallows work is intra-generic, each form becoming a sub-genre in very much the same way as TV. The usage of 80s music makes me feel the cringing and pillow fever of teenage anxiety, pleasure, cruelty, Boy George and fluorescent everything. Breakdancing was a great example of intra-generic cultures being fashioned for hegemonic consumption; most schools had PE classes teaching the skills of moon-walkinga gymnasium at sea with awkward, predominantly white, bodies attempting to get with it. The mockumentary Swallow maps is one where consumerism leaves its mark from the days when someone else took responsibility, and identity was in between the lego blocks, damaged dolls and chewing-gum infested follicles. B. S. Thompsons video and video cassettes titled The World of B. S.Thompson rework the domestic and consumerism in terms of overlays. Just as film can now be seen to borrow from what was its lesser cousin (TV) through such movies as Starship Troopers and The Truman Show, the dialectic between high and low art is a landscape blurry with fusions. 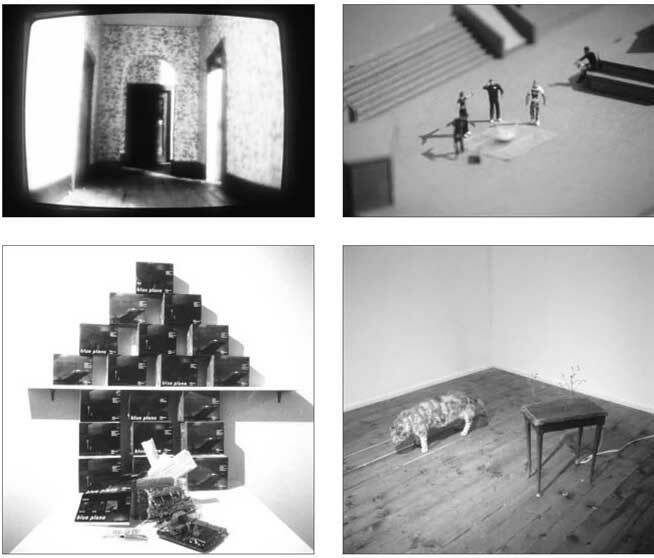 Thompsons packages evoke the world of Mike Stevenson but it is the video which eludes to much more, as journeys through various windows until a castle is seen. Like the computer game Myst, these images are a setting of meaningful fluff where one must know the game to even begin. Reiterating soap operas contextual meanings, this video also relies on soapies absence of action to present the pregnant insinuations. The everyday being ambiguous and ubiquitous, about everything and yet about nothing. The hobby can be seen to disrupt the Tonya Todman complex by situating the ambiguities of art and craft, ready-made and hand-made as witnessed in the work of Swallow and Upritchard. It can be a site displaying the ambiguity and parody of modernity today in the form of Dundons and Van Houts mockumentaries. It can be about negotiating the fluidity of pleasure and desire in terms of dialectics of the neurotic beyond private/public, nature/culture, ready/hand-made as suggested in the work of Upritchard, Turner and Thompson. The hobby could represent the implicit nature of consumerism in the 90s as opposed to its explicit profile in the 80sit could also just be an unreflexive fashion of postmodernism. The work in Hobbycore negotiates various intersections between representation, consumerism and domesticity. If postmodernism was (or is) a crisis of representation and modernity is marked by parody and ambiguity, then it is the site of the hobby which illustrates this phenomena.